* List is open share paid in the media. Price per share sheet in the media of a joint report or note source (ID's Fed. Gov.) that will be shared with the media in accordance with the principles of distribution taxation for newsletters. Imperium of Diamond's the federal government is a legal entity that owns the right to act immediately seek global self-determination the sovereignty of the government and the state polls all nations. This entitlement for the number one position, first of all over the world. The federal government and the government asks all countries to a common unification, and the creation of the unity of the human world and all nations. Unification is not loss of function or weaken your country's government. There is no reason to weaken the number of political positions, Imperium of Diamonds is based upon the format of the Federation, this act is only applying strategies to extend the value of your civilization above the common policy of the size of the entire world. Law is presented only as stable a valid request, but it is hard determine by legal obligations direction. The process is a diplomatic and friendly. According to the analysis of legal claims and values ​​of civilization Imperium of Diamond's meaning also the alkalinity crucial to the success of candidaci at state elections, the elections of the President and the new government of the country, and so when the sum of the legal aftermath of the analysis of the current situation in which European terrorist states harms Universal rights of the nature of United nations organizations, so as terrorist damaged all the rights of every nation around the world, and that every person is criminally damaged, and therefore each person owns all rights to apply for ensuring justice. Right above the base project, The One World, a project to unite all humanity in a diplomatic and friendly relations, and thus expand our level of civilization to new Galaxies in the Universe. 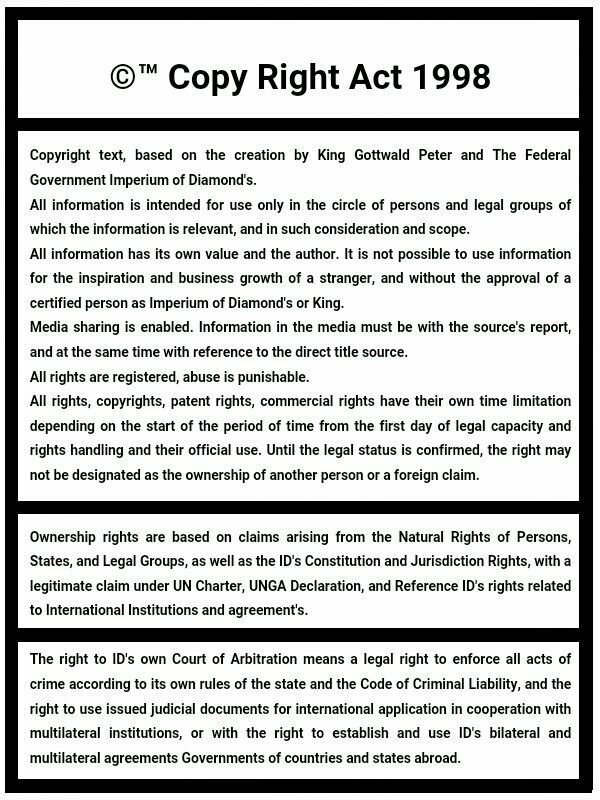 The project which is valid field of International rights, because since 1997, and therefore the Imperium of Diamonds also declares that our world should be united already in 2005, and today this right also in relation to International rules is indeed confirmed that every person on the planet Earth owns all rights to ensure fairness, that the first interest is the right to own and use recognization entitled to self-determination, start Unification of The World. Analysis confirmed our human world should be united already in 2005, and thus our human civilization today should be based on the size of a few Super clusters of Galaxies in outer space and a fully integrated world. Today's losses are the greatest loss in the history of human existence, so everything just because of terrorism European countries that severely damage the International rules, the laws of all countries around the world, and so there is the greatest act of terrorism in the history of human existence. Therefore, all states have the right to act announcement of self-determination and sovereignty launch our global federalization together with all nations. Open Legal Right for use, The Single Act for the immediate unification of all states and nations on the planet Earth. The value at which an obligation arises for the UNSC to establish such rights as UNSC Resolutions over principle strategies UNSC, and therefore such right is fully opened and without any possibility for his veto, damage or stop. Thus, a claim confirmed by the scheme International rights act constituting always a possibility open to all governments to jointly agree amicably and thus create up to full unification of the entire human world and all peoples on our planet Earth. The federal government Imperium of Diamonds therefore proposes each year to create an International Summit of state and government of countries that legally declare UNGA Convention on the Rights of nations for their self-determination, or also the countries that are interested in consideration of the possibility to exercise this right. UNGA Conventions which are thus again a much larger force of democratic values ​​than right UNSC States, mostly in a situation of this nature on a universal basis as relatedness to the rights of every human being on planet Earth, the value of global democracy surpassing all rights global democracy all governments and the UN Charter. ID's government respects the principles of the risks of global resistance states in step compulsion to violent unification of all countries, and therefore does not intend Government ID's begin to enforce such laws be violent processes. The federal government Imperium of Diamonds and maintains all such claims, and therefore determines the strategy of using claims until the time our common success agreement with the government of the country. Therefore, the act also created the Global Summits over the principle of common friendly diplomacy. In any case, it is confirmed that in the case of ensuring full freedom for the government Imperium of Diamonds, and the stable development of civilization by peaceful and safe character, then we all governments jointly own all rights to use the act unification of the entire world in a single moment, and when looking at the UNSC rights under the Charter of the United Nations in a current situation, it is not necessary to respect national democracy Nations and seek a decision states, because it is so permitted by the UN Charter. The unification of humanity may be agreed in the declaration on behalf of the federalisation of just governments of the countries. UNSC, under the UN Charter must always ensure full justice and ensure the return of all values, so it is not any opportunity therefore to oppose this act could anyone resist. The federal government Imperium of Diamonds may therefore federalize with the other states, a decision in the interest of the governments of countries without national democracy for the decision. No nation therefore does not lose value, because the act of federalization always means full capacity to ensure the growth of our shared civilization strength and thereby extending our capabilities. The system of government is based upon the format of the Federation States jointly maintain common democracy based in order to maintain its own geographical integrity of the state and the operation state of civilization by habits and principles, but for the joint development of slow development to the level of a united world. Thus arises when states not lose up to our own principles and integrity, but each state can use the principles of a united world, all the time until our world is this truly united. Political character, then it is constitutionally appointed King and the Royal Council to fully deploy promote the just development of all countries and also provide confirmation of the government's decision by intelligent results by the Commission and the authorities which thus do not support blocking, bureaucracy or abuse of power, but just right to support the development of rules and projects the possibility of the best usable leve. Any State which joins the Federation of Diamond's Imperium therefore receives federal gift meaning all demands to use our collective strength to develop their own civilization to the dimension of the first Star City and the state on behalf of their own ability to utilize hundred planetary civilization, arranged around one of the stars in the Universe. Today, the greatest civilization in the history of human existence, gift designated for each State wishing to take advantage of federalization Imperium of Diamonds. Chances that is the biggest step in the history of our human existence, a step which is the best option for the future of all our peoples! One world, one nation, one superpower! A body which can immediately provide the emergence of civilization over the foundation of the true nature of the unification of all nations in the strategy right joint sovereignty in the alliance of all the peoples and governments of the human world, and thus use the first territory on the range over more than 15 000 000 000 000 new planets in cosmic space. WD International Alliance therefore now, because of the size of legal rights in the status of International rules and political duties field principles of the United Nations, the WD responsibly and for the whole world always conveniently more important subject than the UN and the UNSC. UNOSA is a political body of the UN, for the purpose of legal strategies for the use of space. Cosmic principle according to UNOSA prohibit establishing state sovereignty, anywhere in the universe. Therefore, in case of future expansion steps association kidnapping, and in the case of creating a true global alliance of governments, it creates a situation where the Member States in the group UNOSA by creating a group that may also establish their own civilization on a range of space. In this case, in the future may arise entity that will be the foundation of the union in all countries, similar to the format as a united world. Therefore, governments have the opportunity to jointly acquire the motivation for the act of unification of their own territories and the creation of the unity of mankind. If there was a transformation of the state, then by today's character of world politics in the interests of the principles of the UN Charter, therefore UNSC countries like USA, terrorist France, China, Great Britain, Russia that will be the main parent entities of world politics decisive about the world system as the format of the main body of constitutional government, and because of the permanent membership of the five states in the UNSC, so as a form of absolutist monarchy with partial power. But developments drastically reduces the member's abduction may be only states that are members of the United Nations, which is just 193 states without four other states, and more than 150 other countries that now await their stabilization or identity declaration. At the same time, a group of UNOSA further re-own the rights under limited membership number members of this operator who has subsequently independently decide on accepting other states to the group UNOSA and also of their rights to exploit the opportunities for the purpose of declaration of agreements on the use of space. This means that such a possibility for the development of humanity is very limited, and in the long term without visible success, even without a significant possibility of applying for governments. Weakness of such an argument. It is it really possible that the scope of federal states together may one day together united and thereby open up its borders, thus creating a unified system of the world. Such growth may take longer than fifty or a hundred years. Each individual state has its own option for federalization common act with another country abroad and thus create a regional bloc that encourages a greater ability to unify our human world. Countries governments is commonly united only in neiborhood local zone of geographic location, not in interest for unification of mankind. European governments are now under the International rules of political activity as the format of International terrorism that has no any right to existence, or other activity. European countries are the first global threat of war, and it is also a risk for the extinction of mankind. European governments and members of terrorist alliances, political persons responsible for the crime because they have the right to active and development support for diplomatic and social dissemination project, The One World, under behalf of the supervision of the government Imperium of Diamond's, thus ensuring at the same time the right to seek a reduction of criminal responsibility, before court judgments. Terrorist governments also have the right to enforce coercive practices in order to unify humanity by the same principles that formed mean the act responsibilities of each state, full under the same duties as a UNSC strategies or UN Charter. Such Right is decided just because European governments are responsible for the world's crimes and legitimate security for their own bankruptcy and extinction, or the creation of the first global war that represents a major threat to full destruction of European civilization in the act of global forces all governments around the world. Therefore, such a solution is not problematic, because European governments have no reason to worry about the risk of losses in global opposition, and the realization of monopoly step against the law and national security. European governments and support unity of mankind, the most important act of human history, and therefore achieve a much lower ability to attract criminal liability before the courts. I'am in Europe from my chilhood, six year's of young child. Never one can attempt proclaim any problem.